The GTR Asia India Trade and Treasury Conference, 2017 was organized on February 22, 2017, at Taj Lands End, Mumbai. Returning for its 14th year, the conference also included treasury and fintech aspects relating to trade. It witnessed several worthwhile discussions, ranging from the mechanisms, structures and risk management strategies to succeed in the Indian market, to the transformation of trade and export finance by technology, and the opportunities and challenges for the financial sector in light of the same. 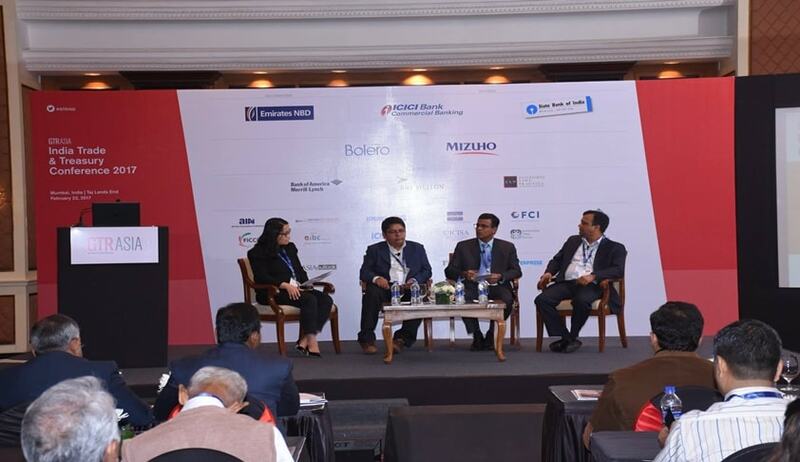 “Disruptive technologies including fintech and blockchain are game changers for the financial industry and can potentially revolutionize the way trade and financing is done in India today, leading to greater efficiency, cost minimization and increases in cross-border trade,” the conference brochure stated. The conference saw attendance from several industry specialists, including Karthik Natarajan (Head, Rand Merchant Bank), Babu Sivaprakasam (Head of the Banking and Finance Practice, ELP), Deep Roy (Associate Partner, ELP), Rohit Goyal (Senior Relationship Manager- Receivables & Supply Chain Finance, EFA Group), Riyazuddin KM (Chief Finance Manager, Mumbai Refinery, Bharat Petroleum Corporation), Khushnama Davar (Managing Director & Head Trade, India Banking, Standard Chartered Bank), Ajay Sahai (Director General & CEO, Federation of Indian Export Organisations), Sunil Joshi (General Manager, Export Credit Guarantee Corporation of India), and Jovilyn Cotio (Relationship Manager, Supply Chain Finance Program, Asian Development Bank). While one of the panels examined the security concerns for fintech, and explored the preparedness of the banking sector to move away from paper-based trade, another held discussions on sketching a roadmap for trade financing in India, exploring new financing options for SMEs, analysing the usage of cluster financing by SMEs to diversify risk, and scrutinizing India’s preparedness to move away from traditional letters of credit. The Conference also had Madhwaprasanna Gummanur, Commercial Director, SWIFT addressing the domestic market needs of India’s financial industry, while Ranadeep Mookerjee, Trade Product, ICICI Bank explored the innovations in the technology architecture, with the entry of blockchain. Further, one of the sessions gave the trader perspectives on the outlook for trade and commodity finance. The panel discussed the price fluctuations and trade volume forecasts across India’s key commodities, and identified new markets and emerging hubs for trade. It also reflected upon the usage of the National Commodity and Derivatives Exchange’s (NCDEX) guidelines for warehouse service providers, in strengthening the risk management framework for warehouse financing. Mr. Sivaprakasam, however, expressed that he expected more representation and inputs from public sector banks at the conference, as they have a huge role to play since they cater to a large proportion of MSMEs. He was further of the opinion that digitization and technological advances in the Indian banking and trade sector is a “need and requirement”, rather than a “want or wish”, and that any disruption would be met with parallel solutions and regulations as has been witnessed in the past.